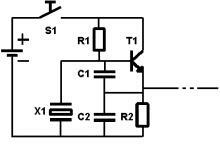 In fact, it is only a simple Clapp Oscillator with the output directly driven into a few meters of wire. The transmitting frequency depends on the used crystal. This may be any crystal between 1 and 15 MHz, higher frequencies may perhaps work also, therefore you may lower the 2 capacitors a little bit. The transmitting frequency is not only the one shown on the crystal, but also “harmonics”: If you have for example a crystal of 3.56 MHz, then it transmits (of course) on 3.56 MHz, but also a bit at 7.12 MHz (2 * 3.56), 10.68 MHz (3 * 3.56), 14.24 MHz (4 * 3.56), etc. The operating voltage is not critical, a 9 volt battery will do the job.